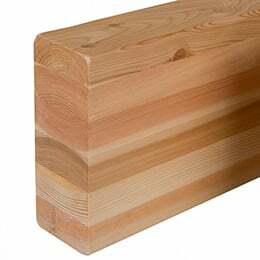 Glulam (glued-laminated timber) is an engineered structural wood product that consists of multiple individual layers of dimension lumber that are glued together under controlled conditions. All Canadian glulam is manufactured using waterproof adhesives for end jointing and for face bonding and is therefore suitable for both exterior and interior applications. Glulam has high structural capacity and is also an attractive architectural building material. Glulam is commonly used in post and beam, heavy timber and mass timber structures, as well as wood bridges. Glulam is a structural engineered wood product used for headers, beams, girders, purlins, columns, and heavy trusses. Glulam is also manufactured as curved members, which are typically loaded in combined bending and compression. It can also be shaped to create pitched tapered beams and a variety of load bearing arch and trusses configurations. Glulam is often employed where the structural members are left exposed as an architectural feature.